Home / Spring / St. Patricks Day / tablescape / Luck of the Irish! St. Paddy's day is approaching. I thought it would be fun to create a tablescape. My Bordallo Pinheiro dishes always come in handy. Notice the Shamrock design I created with beads. Just a quick update: I worked in our yard for two days, then came down with a terrible headache. 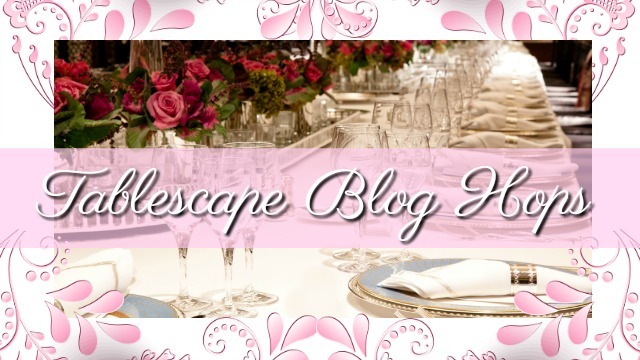 When I feel better, I will be visiting blogs again. Oh how cute! Those hats on top of the mini cloches are too cute! I like the beads made into a shamrock- cute! Those are cute napkins- I haven't seen any like that. 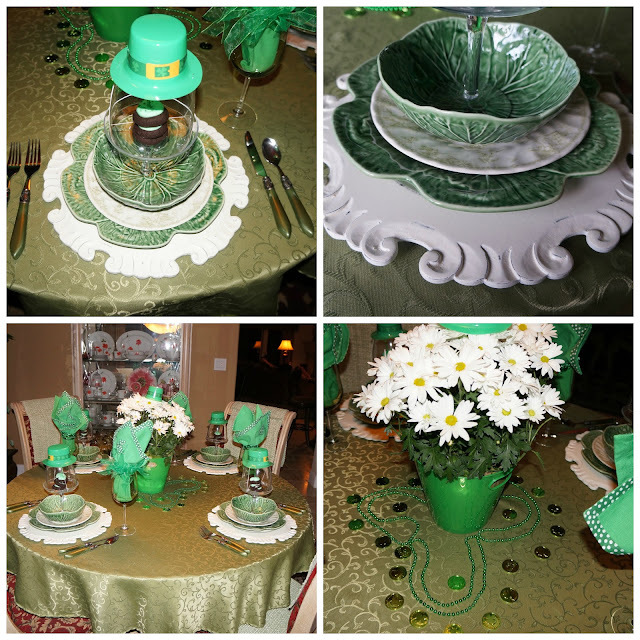 I always enjoy seeing everyone's St. Patrick's day tables! 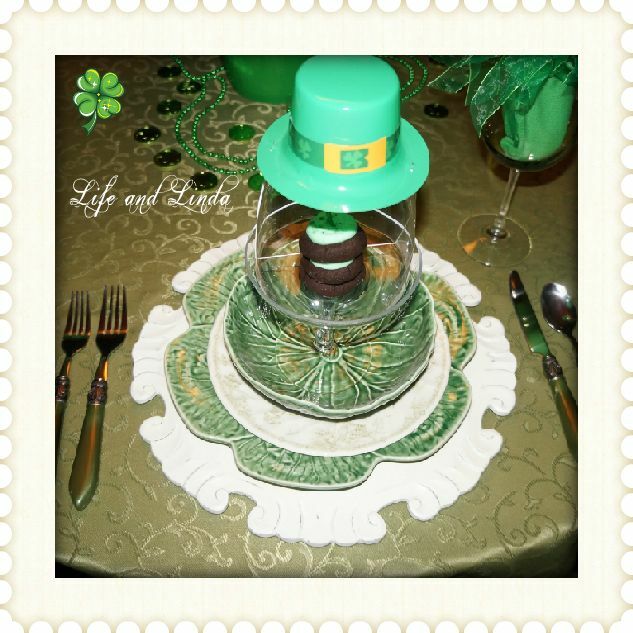 What a great idea to make a shamrock design with beads. This post made me smile because I am using the same Bordallo Pinheiro dishes for my table. I just need to photograph it! Glad your SIL found the dishes you needed. So very cute Linda. Nice table! Your table is so cute and pretty. Love the dishes. 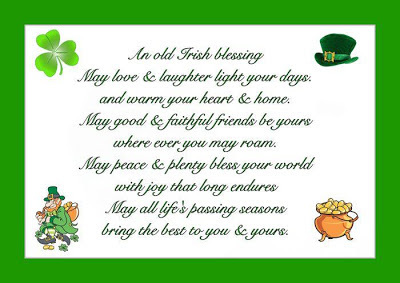 I love St. Patty's Day, it's just fun! Hi Linda, what a cute St.patrick's tablescape I love the plate and the cupcake it is a lovely and fun tablescape! So pretty! I love, love the dishes. You're always so creative! What great dishes from Ross, Linda! How sweet of your SIL to find the extras for you. 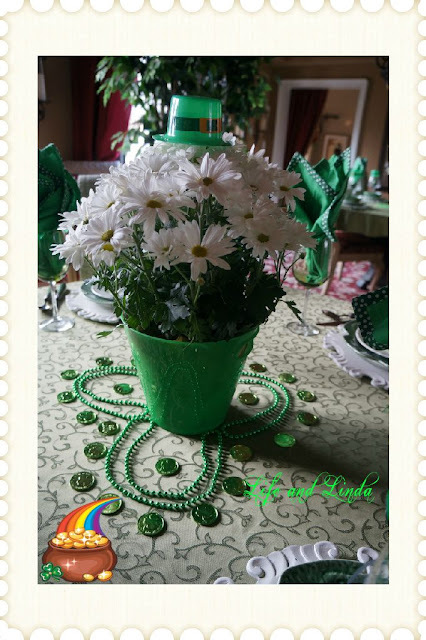 I love your beaded shamrock design that you made around the flowers. The individual pedestals with the cloches are so sweet. 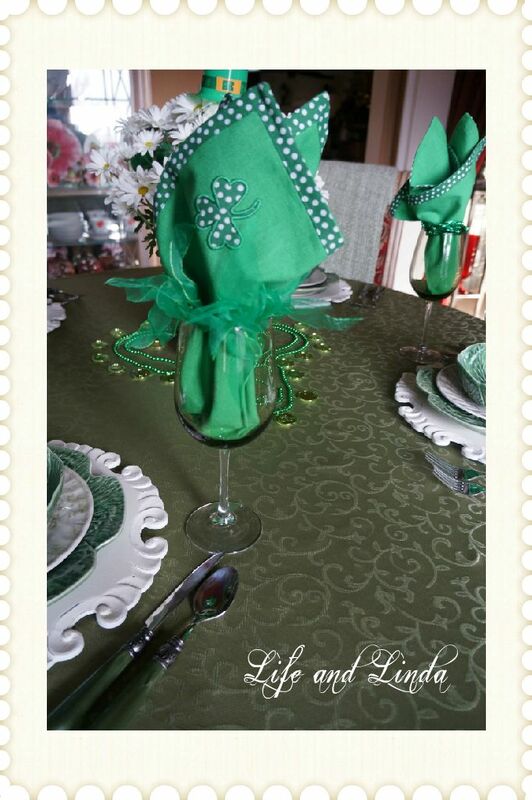 I love your pretty 🍀 napkins, too. 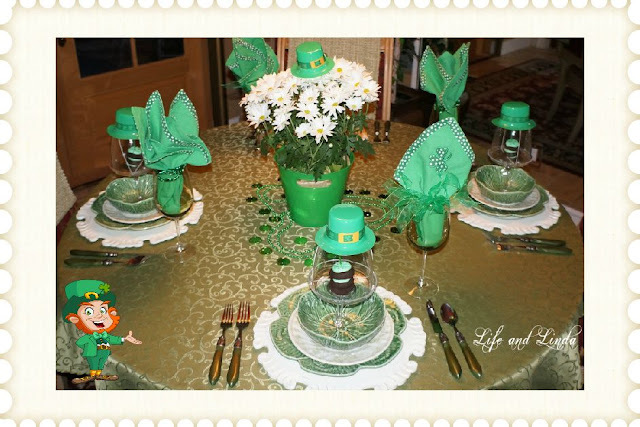 Your tablescape is lovely, I especially like the Shamrock design you created with the beads..The Irish Blessing is very touching. 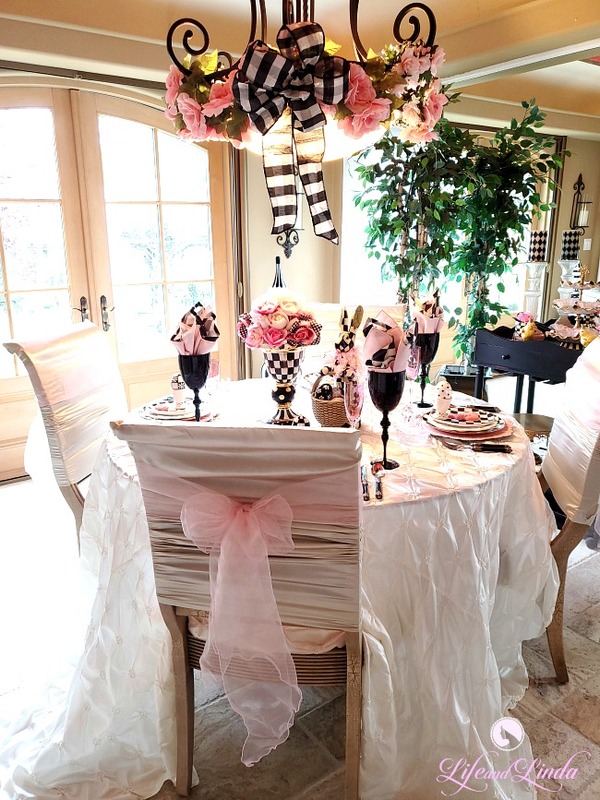 Everything on this tablescape is just perfect, Linda! Very creative use of the beads & your little hats on top of the pedestal cloches was a brilliant idea. I really, REALLY like your pretty white chargers, too. Well done!!! That clover from beads is just too cute! Really creative! This is a great Spring/St. Patrick's Day look! Adorable! 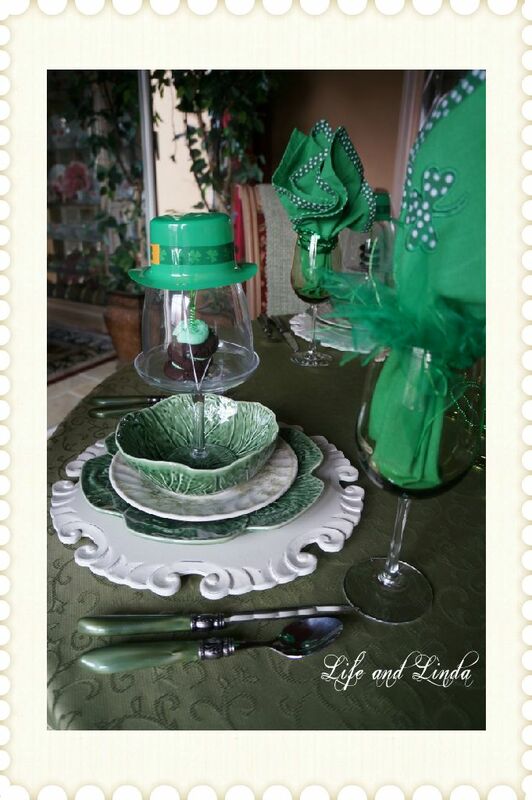 Love the leprechaun hats atop the glasses as mini-cloches! They add a wonderful touch of whimsy -- and delight from the treat inside! Linda You are so beautiful. I love my blog. You caught the essence of me. 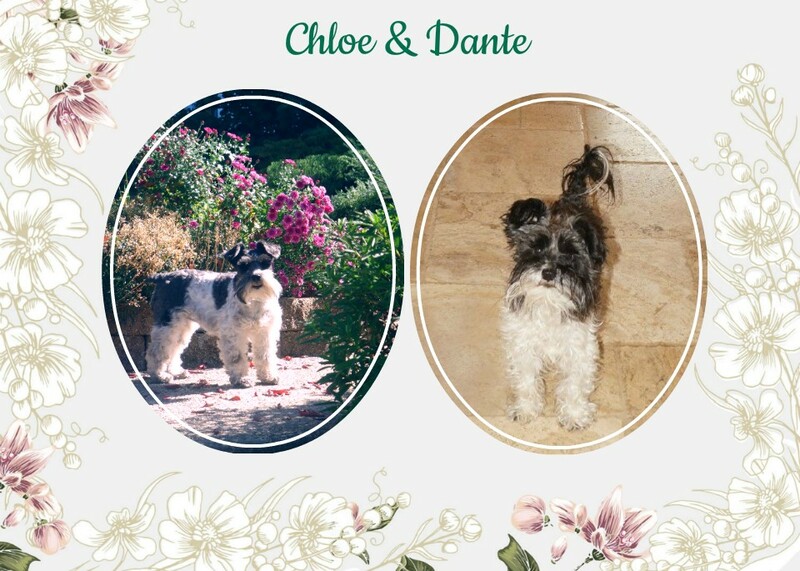 the pet pictures so cute..I am still glowing with the excitement of seeing it.Thank you so very much.love your StPat's day tablescape.I will be following. Did you get my email? You are so welcome Vernice. 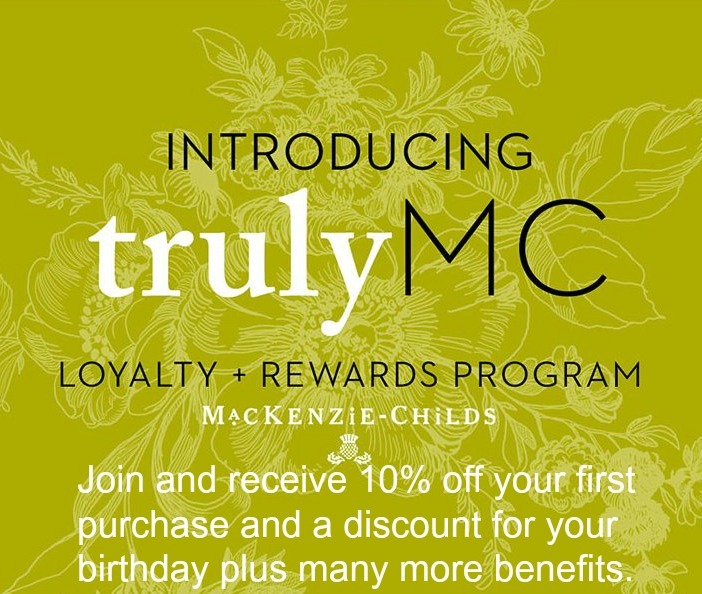 I was happy to make over your blog. Your Tablescape for St. Patrick's day is so cute !! Looks like you had a lot of fun putting this all together with all your touch's of whimsy sweet. I hope you have a wonderful week with your family. 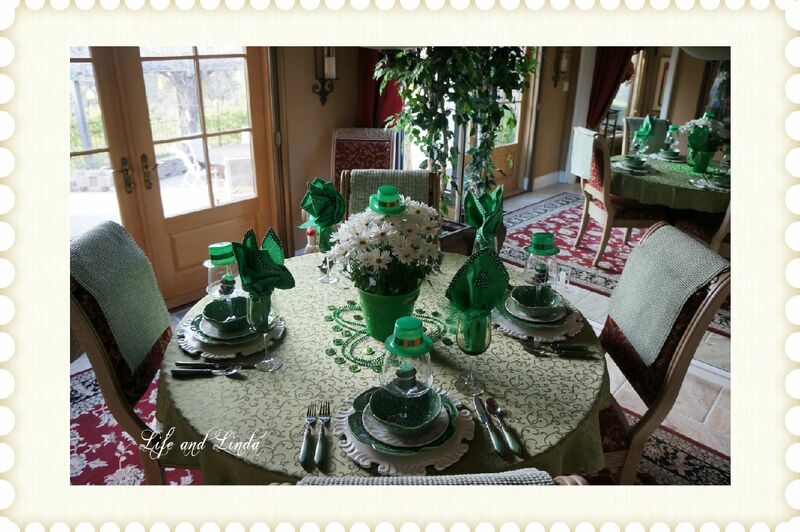 That's an adorable St. Patrick's Day table! I love the little leprechaun hats and admire your attention to detail with the beads! Oh, your headache just sounds terrible! i really pray you get well soon. 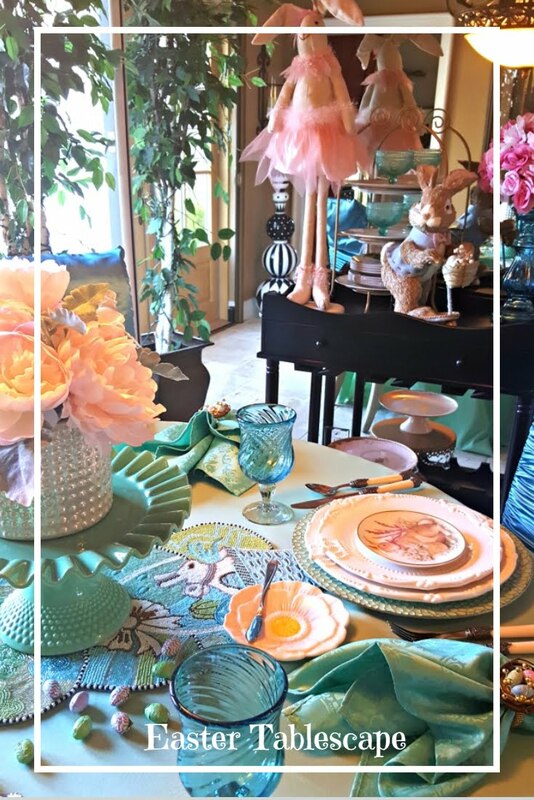 Your tablescape is just so fun! i love it and I think you did a really original job!! 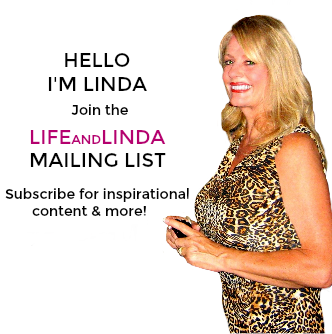 Love your table, Linda! I have collected those plates for years and love them. Hope your headache is better...have a great weekend! :D Your centerpiece is so clever with the beads. 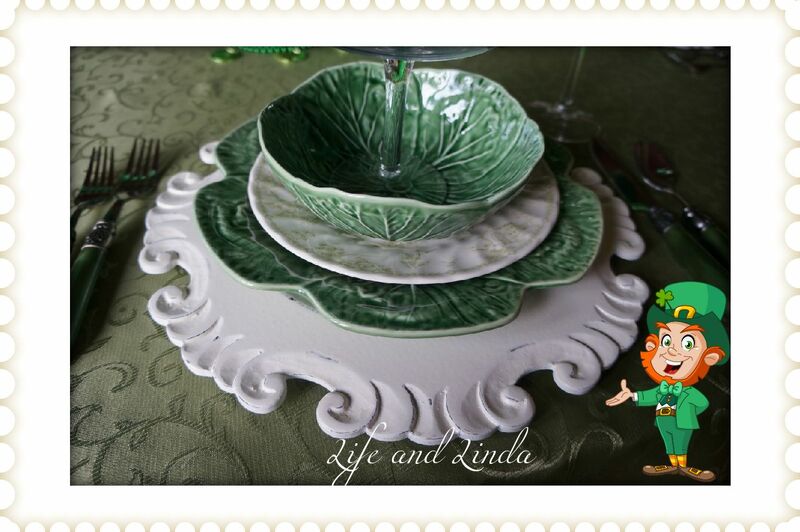 I love celebrating St. Patrick's Day, and I love your tablescape! I hope you're feeling better today, and I need to borrow your little leprechaun, LOL! He's too cute! 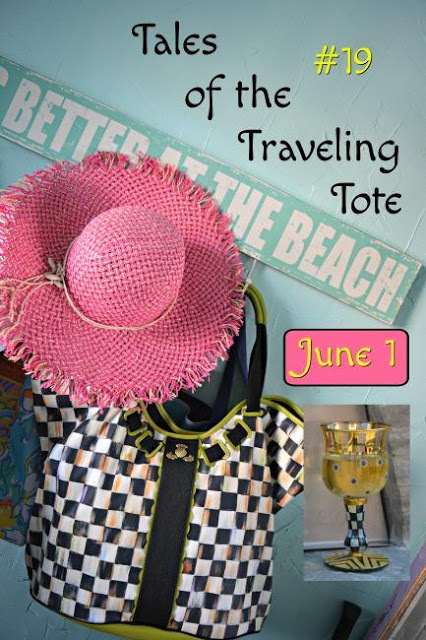 You did an AH-mazing job with Ginger's blog. It is adorable! I hope you are doing better and get well soon.